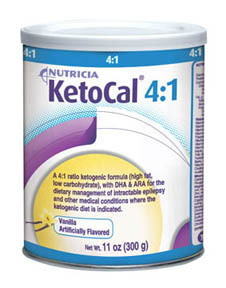 Nutricia KetoCal 4:1 is a nutritionally complete, ketogenic formula in a 4:1 ratio for the dietary management of intractable epilepsy. 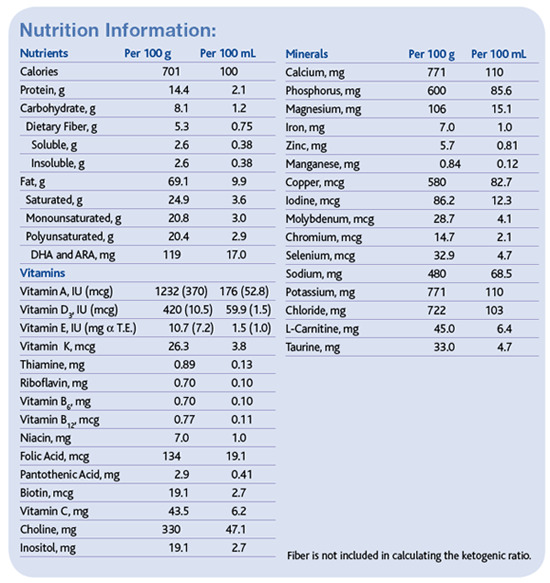 KetoCal 4:1 Formula is supplemented with DHA and ARA. It contains a multi-fiber blend and has no trans fat. KetoCal is aspartame-free (contains sucralose). It is indicated for intractable epilepsy, Pyruvate dehdrogenase deficiency (PDH), Glucose transporter type-1 deficiency (GLUT1DS), or other medical conditions where a ketogenic diet is indicated. KetoCal 4:1 is designed for individuals over 1 year of age. Vanilla flavor.